Another big name working on a high street budget, Kelly Hoppen has teamed up with B&Q for a new wallpaper range. The designs are quite varied in their style but one that leaps out is the Hicks wallpaper. The name seems to be no coincidence as the geometric shapes of the design are obviously strongly influenced by some of David Hicks' looks in the 1960s and 70s, such as his hexagonal wallpaper. 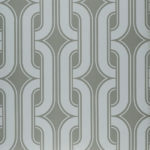 Hoppen has given a contemporary feel to her design by playing with different textures of paper with both of the two colourways available for this design, as shown in the image above, using a silver effect. The paper costs £19.98 a roll (compared to a reissue of an original Hicks design which will cost you around £50 a roll).